FMK Entertainments - Professional High End Karaoke Services! South East Queensland, Sydney Metro-Area, Mid & Northern Rivers NSW regions! All of our karaoke services and entertainment shows feature 100% legal music! Featuring superior equipment, superior sound, superior mixing and our very large computerised regularly updated database of songs means one thing— We bring you the best high quality modern karaoke experience “Where You’re the Stars”! Sing your favourite songs using our dynamic UHK wireless microphones & CTV knowing that our professional karaoke hosts (KJs) will ensure the karaoke show runs smoothly all night long. 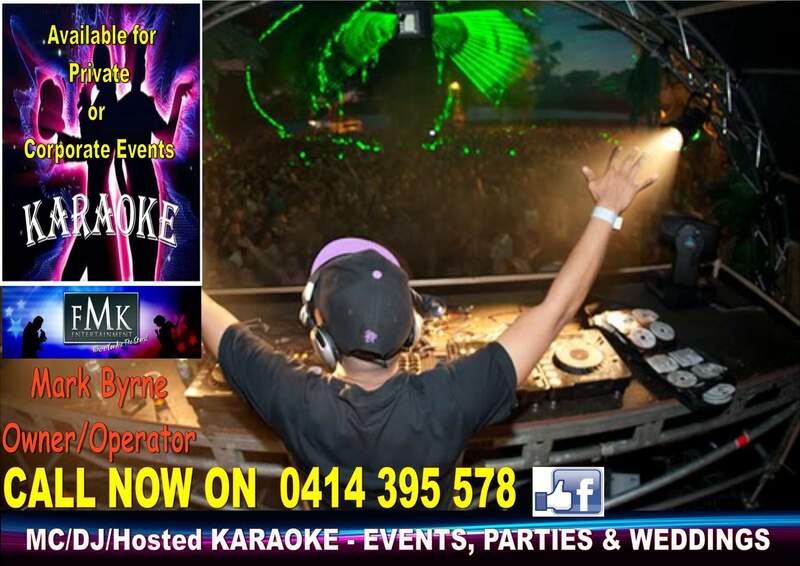 *Hire only Australia’s best karaoke services for your next private party or event. Need a DJ for your upcoming event? Whether you’d like us to create a memorable music program from our huge DJ music selection including the most popular songs as well as the very latest hits or have us throw some karaoke into the mix— we’ve got all your needs covered! Perfect for all types of celebrations including anniversaries, birthdays, parties, dances, bar mitzvahs, holiday parties and corporate events. Ask us about being Master of Ceremonies for your event (if required). *Contact us today for more details & to view our DJ music lists. FMK Entertainments has provided countless professional corporate entertainment packages throughout Sydney. Most fully customisable services are available at just $125 hourly rate. Full DJ setup, MC services, effects lighting, microphones and any choice of music.